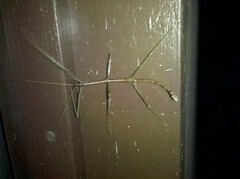 Ladies and gentlemen, I present to you, the phasmatodea, better known by it's colloquial name, the stick bug. Phasmatodea are an order of insects whose natural camouflage makes them resemble small sticks or leafs. I found this particular one crawling on the wall of Jason's garage two weeks ago. This specimen decided to play dead when I picked it up. Nice tactic. Had it been a chillier night, this stick bug's excellent camouflage may have gotten it tossed into a bonfire. Lol nice, looks like it survived to meet a later bonfire then.